You could wear your (possibly beat-up) running shoes to boxing class and during strength-training sessions—but you’d be missing out, say fitness pros. Their expert advice? The best shoes are ones with features that specifically support your workouts—like lateral stability for dance cardio class or flat soles for CrossFit—because it can seriously improve your experience and performance. Originally posted July 5, 2015. Updated July 14, 2017. 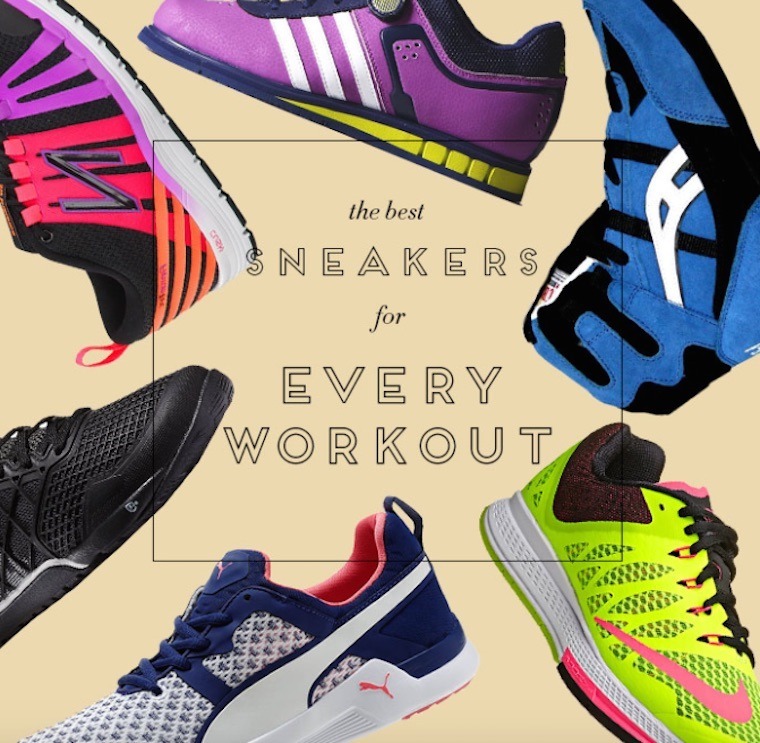 Scroll down to see the best sneakers for every type of workout. “For dance, your shoes need to be responsive to fast, agile movements—look for lightweight, form-fitting shoes that don’t hinder you,” says Body Conceptions founder and former Broadway dancer Mahri Relin. “For cardio work that involves jumping on the toes, cushioning under your forefoot is especially important,” adds Relin, who generally wears Brooks models like the Ravenna 5 (although they’re technically designed for running). You should also look for lateral support and a wider toe box, she says. “A good pair of weightlifting shoes should provide you with increased awareness of weight through pressure in the heel and better balance under the bar,” explains super smart trainer Dennis Remorca, owner of Remorca Fitness on New York City’s Upper East Side. Remorca says you should also think about technique or range of motion deficiencies you might have, like ankle immobility, which a skilled trainer can help you identify before you shop. “On a treadmill, you can go for something a little lighter than what you’d run in outside,” says Katie Bottini, a Nike run coach and fitness model. Why? “A treadmill is a little more cushioned then the road, there are no uneven surfaces, and if you’re using the treadmill primarily for intervals or shorter runs, which most people do, a lighter shoe can help to have a quicker turnover for intervals,” she explains. Just make sure you’ve got fit totally covered (i.e. they address your high arches or excessive pronation) and your pair is the right size. “Many people wear sneakers too small or too big, which can lead to all types of injuries!” she says. “I recommend light-weight cross-trainers with a lower profile,” says Krystal Dwyer, a top instructor at New York City group rowing studio favorite CityRow. “In the case of say, heavy barbell lifting, you don’t want to be standing on a big sponge, like the large, squishy heel in most running and athletic shoes….all that cushioning diminishes stability, joint strengthening, transfer of power, and explosiveness,” says Eric Christensen, coach and co-owner of Boulder’s CrossFit Roots. “Wearing running shoes with thick, chunky rubber soles with lots of grip will prevent you from working well on your feet, and any good boxer knows footwork is one of the most important fundamentals,” says Alicia Napoleon, a Golden Glove champ and head trainer at Overthrow in New York City. Pair your new shoes with one of these top activewear trends and one of these chic gym bags.